A report released by the Urban Indian Health Institute in 2018 shows that over 500 cases of missing or murdered indigenous women have been found throughout the United States – many since the year 2000. 70 women had gone missing or were murdered in Seattle and Tacoma. 6 were reported in Portland. 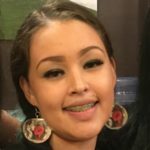 KBCS’s Yuko Kodama interviewed Kayla Crocker of Chemanis First Nations about her journey of looking for her aunt, who had gone missing.